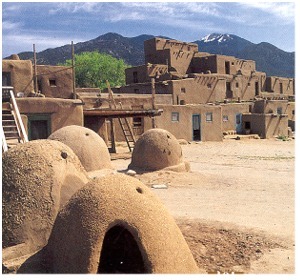 The image shown here depicts Taos Pueblo in northern New Mexico. It's the oldest continually inhabited community in America, having been occupied for more than a thousand years. Historians like to say that indigenous tribes have been around "since prehistoric times." This seems essentially true. American Native Tribes of the north and west are believed to have migrated from places like Mongolia and other Eurasian continents, about eight thousand years ago. They are said to have crossed the Bering Strait, traveled through Alaska, and trekked across part of Canada to get here. Today, there are hundreds of Indian reservations and Federally recognized Native American tribes throughout the United States. How Old is the United States? The USA (that part of North America that extends from the Atlantic Ocean to the Pacific Ocean, and shares land borders with Canada and Mexico) was founded by 13 colonies that declared their independence from Great Britain on July 4, 1776. The colonists called this land "The United States of America," and were recognized by Britain as sovereign states in 1783. Spanish explorers were the first Europeans to arrive in what is now the United States. They were among the second expedition of Christopher Columbus, which reached Puerto Rico in 1493. Members of another expedition reached Florida in 1513. By 1540, the Spanish exploration had spanned much of the United States, including the Great Plains regions and parts of Arizona. The first European settlement on American soil was in what is now St. Augustine, Florida. A small group of Spanish explorers settled there in 1565. Much larger Spanish settlements appeared soon after. These included Santa Fe and Albuquerque (New Mexico), along with San Diego, Los Angeles, and San Francisco (California), as well as San Antonio, Texas and Tucson, Arizona. Politically speaking, 2020 marks the 244th "birthday" of the United States. But long before Europeans colonized the American landscape, various indigenous tribes lived for many centuries in what is now known as the USA. These tribes had occupied the area for many thousand years.